This is the official government website for The Town of Littleton, in Halifax County, North Carolina. The mission statement of the Town of Littleton, NC is to progressively enhance the quality of life for all citizens, businesses and visitors and to protect our historic resources and to celebrate our diversity in a safe and clean community. The Town of Littleton’s vision is to promote and improve our quality of living, enhance our sense of community and preserve our historic small town heritage. We strive to sustain the public trust through open and responsive government and provide a safe and clean community with efficient and effective quality town services with diverse opportunities for cultural and economic development and to foster a healthy environment where individuals and families choose to live, work and play. 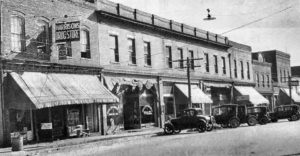 Incorporated in 1877, Littleton encompasses approximately a square mile around the traffic light at Mosby Avenue & US Highway 158. We are nestled between Halifax and Warren Counties, about midway between I-85 and I-95, just below the Virginia border. The town was named for William Little who was a state senator when the town was founded, and he was also the first Postmaster of Littleton. The original post office was “Person’s Ordinary” and is still standing in its original location on Warren St.
We have been known as “Little People Town”, or “The Little Town with the Big Heart”, or “Gateway to Beautiful Lake Gaston.” Whatever we’re called, we invite you to live here, open a business here, or come visit any time!